Hello creative people! Welcome to my blog. 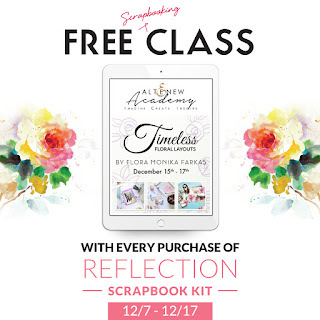 Today we are introducing Altenew's first scrapbook kit called Reflection. My inspiration began with this stripe black & white paper and of course those cute photos of my baby girl too! I am always attracted to graphic lines and hence the stripe papers were arranged that way. Once the patterned papers were adhered on the cardstock, I added pretty embellishments all around the photos. The hint of red sure made the layout stand out. And completed with more details to enhance the layout. Absolutely love the end result! Here's the list of the blog hop participants. 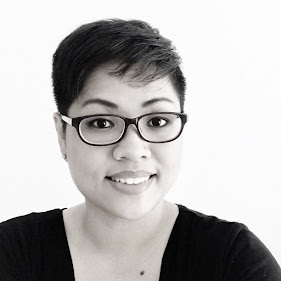 You next stop would be Stephanie Buice's blog. Be sure to leave a comment on all the blogs for a higher chance of winning. 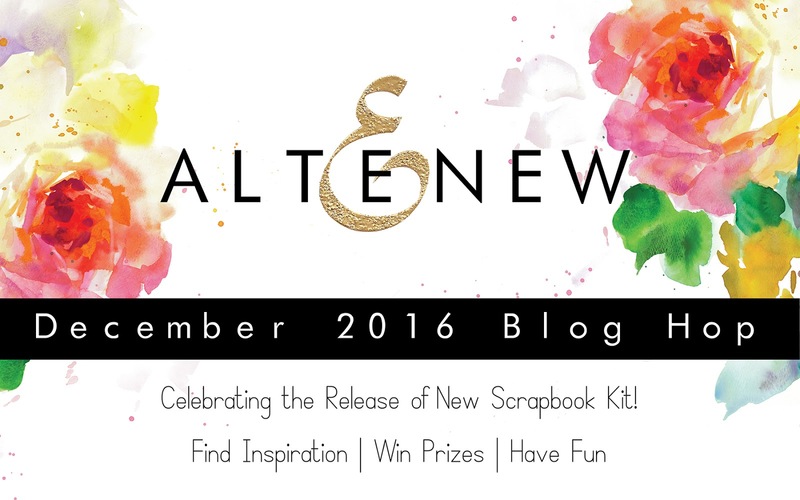 Do swing by on the 15th to check if you are my blog winner! Thanks for hopping by! Your layout is super sweet and your daughter is so adorable! I love it! What a beautiful layout! Lovely and clean. I thought this layout was very nice...That little girl in the photos is adorable.....Thank you for allowing me a chance to win a prize...Have a blessed Holiday!!! What a cute layout. Your little girl is adorable!! Beautiful layout. Thanks for the chance to win! Your little girl is precious and the pages beautifully done. Thank you for sharing your ideas. I love your layout! The black stripes are so eye catching! wow, jessy...absolutely amazing. so beautiful. you are a wonder! Great eye catching layout! Love the black and white with the beautiful photos!! Thanks for sharing on this fun blog hop. You did an awesome job on the layout. Thank you for the chance to win. lovely layout & very cute "elf". Lovely layout! What a cutie pie! Beautiful layout and your daughter is lovely! So nice to meet another Malaysian thru the Altenew! Love your layout. It is stunning in its simplicity. Such an elegant layout and those papers are to die for! Gorgeous photos complemented with beautiful products, ooh I need to get some practice in! Are those beautiful little roses in the kit as a die or already cut out? Lovely layout. I find white such a challenge! But your layout sure shows how to do it. look at that cutie, and the cute layout! The simple black and white design with touches of pink is gorgeous. Cute baby girl! Love the geometric layout and the little girl is adorable! Love the way you cut up and place your pattern paper. Your baby is super adorable! Beautiful layout. Looks so fresh. Your layout is adorable and so is the baby. Darling page Jesse. Love the sweet embellishments. The flowers are so perfect with your sweet little one. Omg!! Your layout is absolutely stunning...Those gorgeous details are simply wow!! Your layout is stunning. I don't think I've ever seen paper arranged quite that way! I'm a follower. Wow, your daughter is the sweetest thing! Hard to look at the papers, beautiful as they are, when you can look at her gorgeous little face. Aren't the papers beautiful? You did such a wonderful job in creating such an inspiring layout. And what a cute child. The perfect photographers model! Sweet. Wow, your page is beautiful. Beautiful layout ... love Altenew! Great layout, flowers, frame, lines, great and elegant combination! Thanks for sharing! What a perfect layout for your daughter in her cute outfit! The colours cantered around her were perfectly placed. Fabulous! I love your layout and the kit!! Absolutely gorgeous layout. I love the graphic black and white with the soft pink orchid - magic stuff. 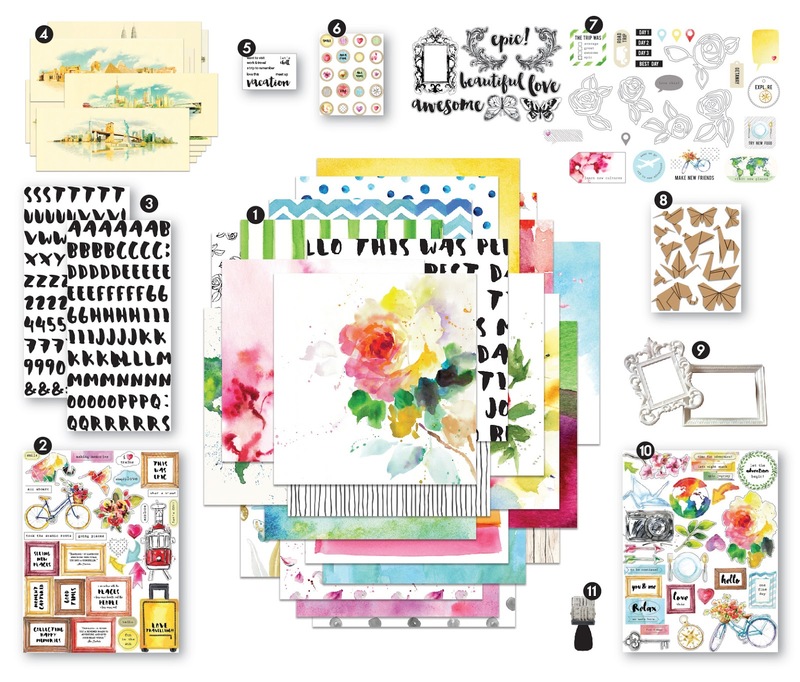 I am looking forward to being inspired by your cute and beautiful scrapbook layouts! Thanks! Such a bold design, but also so light and airy, love it! I love how the stripes draw your eye right to those adorable photos! excellent layout! Beautiful design and cute photos. This kit is so pretty! Awesome kit and such a cute layout. Very cool layout, nice and bright ... but that cute baby!! Very cool layout, love the black and white accents! But that adorable baby.... PreSCiouS! Oh I love the black stripes angled in how pretty! what a beautiful layout! love the use of black and white in it! What a gorgeous kit! Love your sweet sweet layout. Thank you! That white frame is so LOVELY! What a sweet way to highlight your beautiful daughter! WOW! Your layout is awesome!! LOVE black and white and this is a stunner!! This is an amazing kit with lots of awesomeness! Wish I could get it!! TFS! Beautiful layout! Love the use of black and white. Very cute daughter. So sweet. I love the way you highlighted the central photo with the frame. So sweet. I loved the way you highlighted the central photo with a frame. Fabulous! Love the stripes and the color scheme! Such a pretty kit! And your work is beautiful as always! Good to see you again Jessy and what a cute little princess you have there! Congrats! Very pretty layout. I really like the simpleness of the design. Very pretty design. Love the simpleness of the layout. 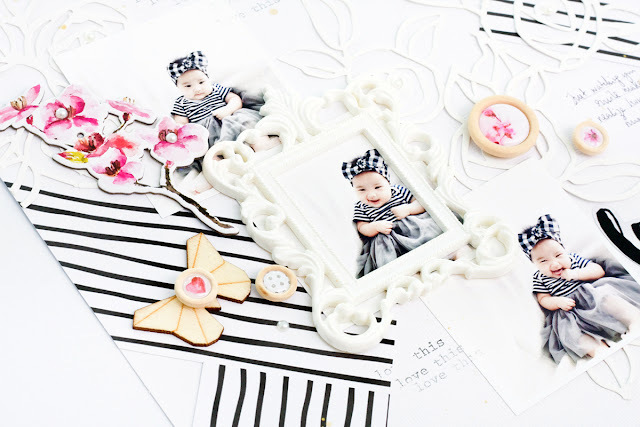 Amazing layout and adorable pictures of your baby girl! New follower and look forward to seeing your creations. 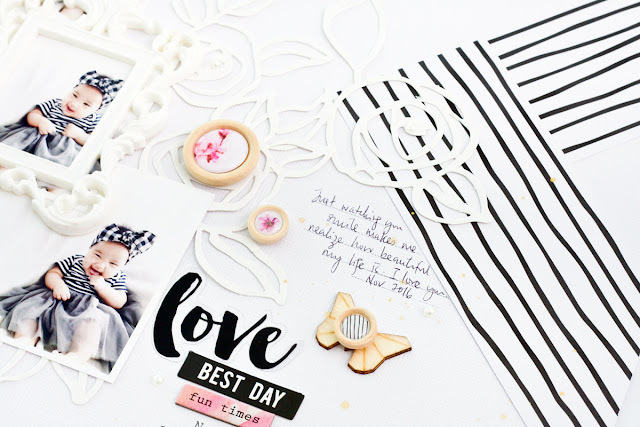 This is a very beautiful layout for a very beautiful baby girl! 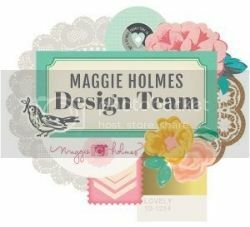 I love the embellishments based off of the Bamboo Roses stamp set! Amé su proyecto Criss es bellísimo ya deseo tener ese regalo en mi poder para hacer maravillas !! Beautiful layout of a gorgeous girl! Love how the stripes draw the eye in to the photos! Beautiful layout with cute baby girl. I love what you did with this. I adore the black and white with a pop of color. Beautiful. Gorgeous layout, and what an adorable little girl! !